The moon in Pisces live in a dream world that is entirely different from reality. People born under the Pisces zodiac sign are dreamers, and the Moon in Pisces sometimes makes it difficult for them to live in reality. They prefer to see the world through rose-colored glasses. This is sometimes helpful and sometimes harmful. But their intuition allows them to be the most compassionate sign. Being the twelfth sign in the zodiac, people say that the Pisces can take on aspects of the other eleven signs. They are in-tune with what others are thinking and how they’re feeling. And, they can step into anyone’s shoes and sympathize with them. They can feel what it’s like to be them. They understand what they’re going through on a deep emotional level. As a water sign that is symbolized by the fish in astrology, Pisces star sign people are often ruled more by their emotions than by logic. They often find themselves swimming through a sea of wants and desires that take them into a fantasy realm full of possibilities. The Lunar Pisceans can build up a less original take on the world because they truly see everything going on around them in a different light. So even when someone is trying to manipulate them, they understand why. They can look past the false sincerity and comprehend why someone would do something like this. It’s this kind of intuition that helps the Moon in Pisces to accept all walks of life. Their social circle can be quite large even though they are introverts. But people come to them with their problems knowing they will get a shoulder to cry on and a sympathetic ear. 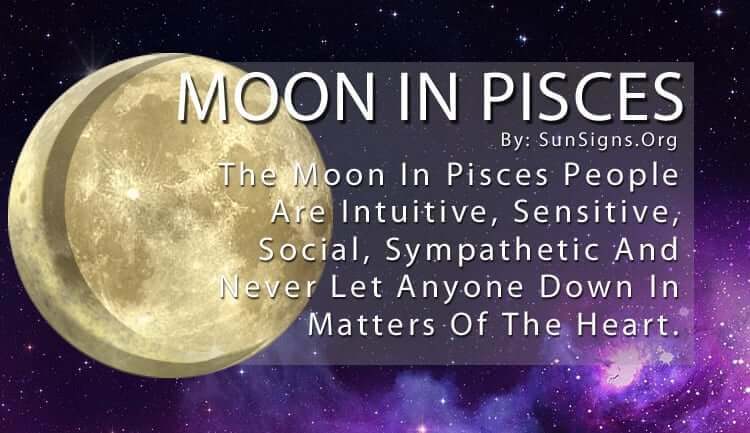 Once you can break through the shy exterior of a Lunar Pisces, you will find a caring person indeed. Pisces Moon people can get utterly lost in their dreams, leaving them vulnerable to the harsher aspects of reality. Because they want to see the good in everyone they sometimes get victimized by those who take advantage of their compassionate nature. Just be careful not to upset them, or they swim beneath the surface and don’t return until the coast is clear. Because they are so understanding of others, they are the most sensitive of all the sun signs, and this makes them incredibly touchy. Another thing Pisces has to be careful of is their forgetfulness. They enjoy being in another world so much they often forget to take care of their responsibilities in this one. They aren’t the most reliable when it comes to running errands and doing chores. This is where having a committed social circle comes in handy, for they often pick up the slack. It’s hard not to like them when your Pisces Moon sign person is so caring and understanding. Even if they don’t manage their life well, they will never let anyone down in matters of the heart and the conscience. Their outlook on the world is refreshing and inspiring, and they want to share it with everyone. And with the Moon in Pisces, there’s no limit to their imagination. You can rely on them to go big for your birthday or other celebrations. And all you have to do is give them space once in a while to recharge their batteries. It’s tiring healing other people all the time, and Lunar Pisceans need to take the time to care for themselves. Next What Is A Wicca Esbat?